David Beckham is the king of tribute tattoos dedicated to his wife and kids, and rumor has it the inked-up soccer star may be planning to get yet another tattoo in honor of his beloved wife, Victoria, to celebrate their upcoming wedding anniversary. July 4th marks 14 years of marriage for the notoriously private but committed couple, and sources say David wants to out-do himself this year with a lavish anniversary celebration – possibly complete with some new body artwork! Becks may be keeping his wedding anniversary plans with Victoria “under wraps,” but the 38-year-old can’t hide a new tattoo from us for long! Check back and we’ll keep you updated on any new David Beckham tattoos in the future. The Beckhams will reportedly be spending their 14th anniversary in Europe, “and the grandparents are on-hand to look after the kids, so they can enjoy the night alone. David’s been known to fill private jets with rose petals and whisk her away somewhere, so who knows,” a source recently told the British magazine Grazia. 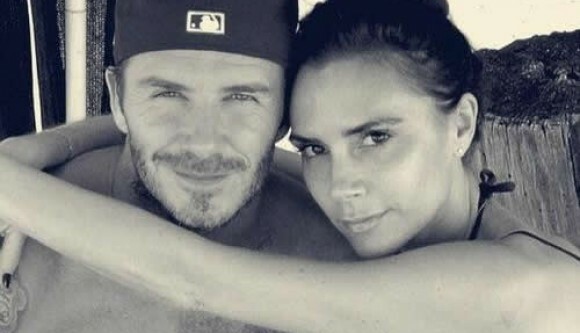 “There’s also talk of him getting another tattoo to mark the occasion and the start of their next chapter.” We definitely wouldn’t be surprised if David Beckham opted for a new tattoo to celebrate his and Victoria’s wedding anniversary. The 38-year-old already sports several tattoos dedicated to his loving wife of 14 years, including the tat on his arm that reads “Victoria” in Sanskrit and a large tattoo inspired by a Brigitte Bardot-style photo shoot Victoria once did for “Pop” magazine, so what’s one more? Although David is definitely the most tatted-up of the two, Victoria Beckham has a few tattoos of her own, and the Beckhams are no strangers to anniversary tattoos either. For their 6th wedding anniversary, David and Victoria got matching Hebrew tattoos that read “I am my beloved’s and my beloved is mine” – David’s on the inner part of his forearm and Victoria’s down her spine. The couple also has matching wrist tattoos that read “VIII-V-MMVI,” the Roman numerals for May 8, 2006, which is the date the two renewed their wedding vows. For their 10th anniversary, Victoria got another Hebrew tattoo, this time inking “Together, forever, eternally” below the Roman numerals on her wrist. David marked the couple’s 10th wedding anniversary on his body too – with a ring of ten roses inked around his right arm.